This is an important book that will help change how America eats and guide parents to heal our needlessly sick children and adolescents. There are 80 million infants, children and teens in America, and most have unhealthy diets. Every year, tens of millions are misdiagnosed as having asthma, allergies, nasal congestion, ear infections, chronic cough and croup, when the real problem is acid reflux. A bad diet and childhood obesity are both strongly associated with reflux. So, when a child has a respiratory disease and is not getting better with medical treatment, we believe parents should consider that reflux may be the problem. Why? Because it can be fixed! Reflux is the greatest masquerader of our time. It can be the cause of almost any kind of respiratory symptom or disease. Unlike adults who may have obvious reflux symptoms (indigestion and heartburn), children are almost always “silently refluxing,” and silent means that reflux is mysterious, difficult to diagnose and easy to overlook. Kids with reflux rarely complain of heartburn or indigestion. Respiratory reflux is the missing link between bad diet and many symptoms. Today, respiratory reflux is so common it is almost invisible. Pediatricians and medical specialists often diagnose children with asthma, sinusitis or allergy, when what they really have is reflux. Doctors all too frequently prescribe children antacid medications without beneficial effects. The real villain is not vanquished by pills. Most medications won’t do a thing for children’s reflux symptoms and can sometimes cause more harm than good. Reflux is not only uncomfortable and inconvenient, it’s dangerous. If left untreated, reflux can wreak havoc on a child’s ears, nose, throat, airways, lungs and digestive system. When we fix a child’s reflux, parents’ knowledge translates to significant dietary changes for the entire family. Out go the juice, soda, chocolate milk and other unhealthy choices. When parents understand that too much acid and sugar in the diet, and eating supper too late in the day has a big negative impact on the family’s health, they act. Their children’s well-being is at stake. Once reflux is identified or even suspected, the fix is more in parents’ control than many realize. 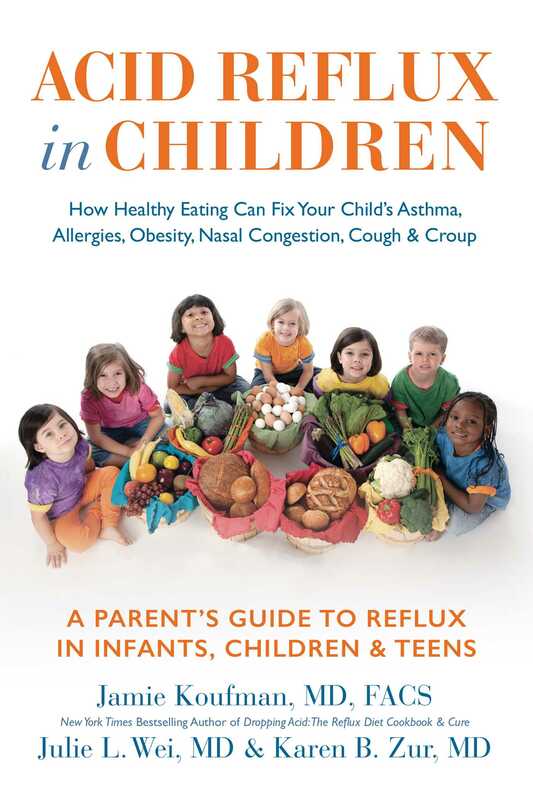 Acid Reflux in Children is the revolutionary book for parents who want to help their children lead healthy, active lives, free of acid reflux and the many other symptoms this condition can create. Here’s to our future - HEALTHY CHILDREN! Dr. Jamie Koufman, one of the world's leading authorities on the diagnosis and treatment of acid reflux, is responsible for coining the terms laryngopharyngeal reflux, silent reflux, airway reflux, and respiratory reflux. She is the founder and director of the Voice Institute of New York and Clinical Professor of Otolaryngology at the New York Eye & Ear Infirmary of the Mt. Sinai Medical System. Dr. Koufman is a New York Times bestselling co-author of Dropping Acid: The Reflux Diet Cookbook & Cure, the first book that offered refluxers an understanding of reflux that emphasized low-acid diet and lifestyle changes to achieve a natural cure; she is also the author of The Chronic Cough Enigma and Dr. Koufman's Acid Reflux Diet. Dr. Julie L. Wei is Professor of Otolaryngology-Head and Neck Surgery at the University of Central Florida School of Medicine and is Surgeon-in-Chief of Nemours Children’s Hospital. She is also the Division Chief of Pediatric Otolaryngology. For many years, Dr. Wei has observed the significant relationship between dietary habits and children’s health, which resulted in publication of her book, A Healthier Wei – Reclaim Health for Misdiagnosed and Overmedicated Children. Dr. Karen Zur is the Director of the Voice Program and Associate Director of the Center for Pediatric Airway Disorders at Children’s Hospital of Philadelphia (CHOP). As a mother of two, and a surgeon with a busy aerodigestive practice, she sees the impact and importance of healthy eating as well as the role that reflux plays on a child’s ear, nose, throat and airway problems. "In the United States, the traditional medical approach has been to focus on treatment rather than prevention of disease and illness. Nutrition and diet, though, can be at the heart of good health. Acid Reflux is a case in point. Drs. Koufman, Wei and Zur through their engaging stories and experience, empower the reader to make healthier food choices through appropriate understanding of the underlying mechanisms of acid reflux disease. Acid Reflux in Children is a must read for anyone treating, advising, cooking for, and/or caring for children with acid reflux disease. It introduces evidence-based yet pragmatic and easy to understand nutritional practices to help health care providers and parents use nutrition and good cooking habits to restore and maintain children’s health. More importantly, working through nutition to eliminate the cause of acid reflux can decrease or even eliminate the need for medication, and improve a child’s quality of life."